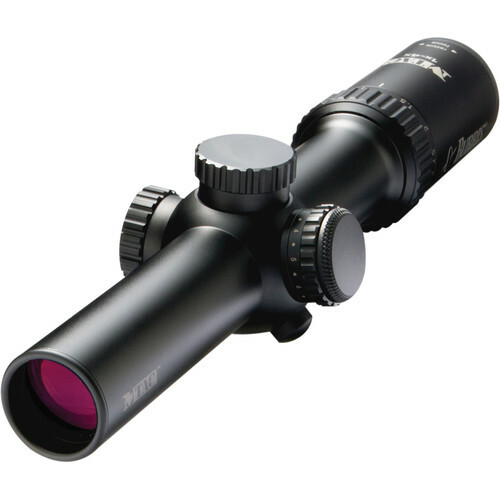 Gain tactical advantage with the Burris Optics 1-4x24 MTAC Riflescope. This telescopic sight is intended for 3-Gun competitive shooters and hunters, and represents a compact, robust, and precise optic that is ideal for fast tracking and target acquisition. Its optical system features index-matched fully multi-coated elements that deliver great clarity and visibility in most lighting or environmental conditions. In addition to excellent image quality, this optic provides a generous 4" eye relief, 130 MOA windage and elevation ranges, and a Ballistic CQ illuminated reticle for laser-sharp placements. This 2nd focal plane reticle is optimized for 5.56/7.62 cartridges and features an illuminated target circle with inner brackets and ballistic compensation dots, which provide elevation compensation out to 600 yards. The illumination system offers 10 brightness settings with "off" positions in between and cast a brilliant red light over the entire reticle pattern. Box Dimensions (LxWxH) 13.1 x 3.1 x 2.6"